Have kids? You’ll love these 8 Mealtime Strategies for Busy Parents! If anyone tells you running a multi-kid household is easy, step back because their pants are probably on fire. It’s not easy, it’s hard work! Meal prep alone is a full-time job so today we are sharing 8 mealtime strategies for busy families. These will help save you time and might go a long way to preserving your sanity. If you love the idea of meal planning but not sure where to start, join the Join the 10 DAY MEAL PLANNING CHALLENGE! today. Your whole family is in their underwear, the dog is in the corner about to vomit up something he stole and ate from the garbage, your 5-year-old is screaming “It’s not fair!” because Sensei Wu– controlled by your 10-year-old– isn’t letting Dora the Explorer ride on his dragon, the whole house looks like a lego bomb collided with a freighter that was apparently carrying endless loads of dirty laundry, and dinner isn’t fixed. Does this just sound like your typical Friday night? Well, guess again, because (ding-dong) the doorbell just rang and your dinner guests that you forgot you invited over just arrived at your front door. You’re screwed! All because you forgot to plan. Try not to step on too many legos as you make a mad dash for pants. If you are trying to avoid some version of the above scenario you need to embrace planning as a key strategy for getting through busy family mealtimes. So, have a plan! And factor in some of the below strategies. The Instant Pot, have you heard of these things? It is a slow-cooker, that also works as a pressure cooker, rice cooker, steamer, yogurt maker, a warming pot, and a browning pan. They are really popular right not and after purchasing one last year, we have to say, we’re sold! We’re on board with anything that makes our life easier and the Instant Pot certainly fits the bill. 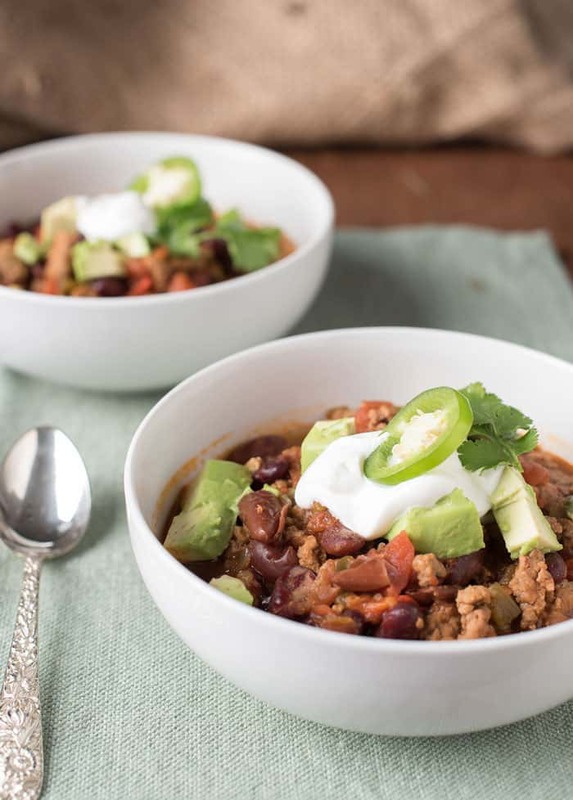 We’ve found that the Instant Pot is great for making easy recipes as well as simple ingredients that we then incorporate into other meals. We love making Instant Pot Chili, Instant Pot Brown Rice, Lentil and Swiss Chard Soup, and these easy to peel instant pot hard-boiled eggs. The magic of the Instant Pot isn’t that it eliminates all work, but in lessens the work and allows you to set it and forget it rather than having to watch a pot on the stove. And you NEED nights when much of the meal prep is hands off! Plus, it’s so versatile and a good tool to have at the ready. If you followed the plan it strategy then it’s possible to actually prep ahead. I know, a crazy idea right? It’s hard to find time to get ahead in busy parenting life, but when you do you take control of when the work gets done and you give yourself back time in the moments when you know you will be tired and overwhelmed. When we make our Homemade Flax Cornbread we have all the dry ingredients mixed the night before and all the wet ingredients right there so that in the morning it’s super easy to throw together. It’s a small thing, but it saves us time during the breakfast rush. Plus, homemade cornbread is WAY better when it’s fresh and warm from the oven. For all of our weekly cooking, whenever possible, we chop and prep ingredients ahead of time when it’s convenient rather than in the chaos of the end of the day routine. Once again, this is not something that we have perfected, but it does mean that when the dinner prep hour arrives, often times some of the work is done. This is huge because this can be a very stressful time of day for families: there’s homework, after school evening activities, everyone’s tired, etc. Trust me, prepping ahead is a great family strategy for making mealtime more manageable. There are even entire businesses like Prep Dish devoted to helping families prep ahead. And for good reason, it’s a skill busy families desperately need to master. 4. Batch or Supersize it! In a similar vein to prepping ahead, you can also batch process meals and/or supersize them. Our family has a fall tradition of apple picking and then batch processing homemade applesauce. It’s a day of hard work (and fun), but we reap the benefits all year as we are then able to pull out fresh applesauce all year to enjoy on homemade buttermilk pancakes or as a side dish. We also sometimes batch prep different recipes with similar ingredients in the same block of time. Our Sweet Potato Kale Paleo Frittata and our Sun-Dried Tomato and Kale Breakfast Frittata have some shared ingredients and prep steps so we save time by doing them together. Why dirty up all of the same pots more than once? Nope! Batch it and then have easy-to-reheat breakfast items for the week. Similar to batching, we like to supersize recipes. Doubling a recipe usually doesn’t mean doubling the work. What it does mean is you’ll have leftovers and an easy meal coming your way later. That’s HUGE for busy families. So if you’re making quinoa for a Quinoa Fajita Casserole, why not double it so you can use the extra quinoa tomorrow for Cilantro Quinoa Burrito Bowls or a Healthy Quinoa Taco Salad. Batching and supersizing all flow into the below 4 Family Mealtime Strategies. If you have leftover food, freeze it! This doesn’t work for everything of course, but there are lots and lots of things you can freeze and preserve for later. This will pay you back down the road. Sometimes we have entire weeks when all we do is eat out of our freezer. It’s such a great safety net for those busy or sick weeks when you just don’t have the time or energy to devote to meal prep. During strawberry season we pick tons of local strawberries and freeze most of them for use throughout the year for strawberry desserts, strawberry smoothies, and cocktails like this Coconut Rum Strawberry Daiquiri. 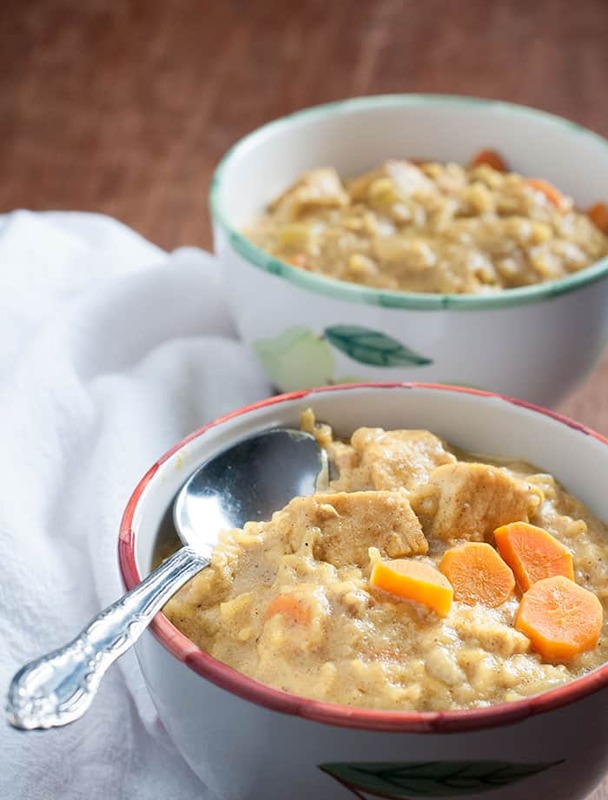 Another of our favorite freezable items is soup. When you’re exhausted and on the verge of panic because you don’t know what you can pull off for family dinner, it’s a great feeling to remember you can pull out Mulligatawny and Asparagus Soup from the freezer. For those items that don’t freeze well, you can always just reheat it the next day. We bank on having leftovers in the refrigerator at almost all times. This is where the plan it strategy comes into play because you don’t want to over-buy and then waste perishable food, but it’s also fantastic to not have to cook every day. So plan it, make it, and then reheat it. Leftovers are great for lunches the next day and we also often try to plan our busy nights so they involve less meal prep and kitchen time. Sometimes that’s because we prep it ahead of time, but sometimes it’s simply because we are living off leftovers. Sometimes it’s not just simply about reheating food, but it’s about using it as part of something new. Reinvent it! When we have leftover chicken that everyone has grown tired of we just use the extras for easy homemade chicken noodle soup. During the summer, after a grill night, we’ll use any leftover corn on a grilled corn salad with basil vinaigrette. It’s not hard, just stay committed to using up all leftovers. Be creative and reinvent it! Combine it is arguably very similar to reinventing it, but we thought it deserved a category all to itself because we are such big fans of one bowl meals. And one bowl meals are such a great way of cleaning out extras in your pantry and your refrigerator. 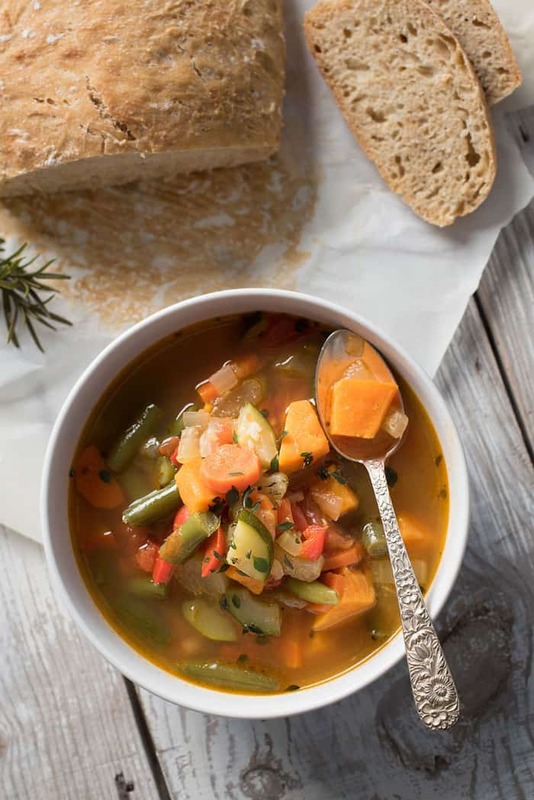 The combine it strategy basically encompasses one bowl recipes that are versatile and can take on lots of ingredients — and most likely that extra produce in the frig that you need to use up. Some of our favorite one-bowl combine-it meals include this spicy vegetable soup and this easy chicken shawarma bowl. 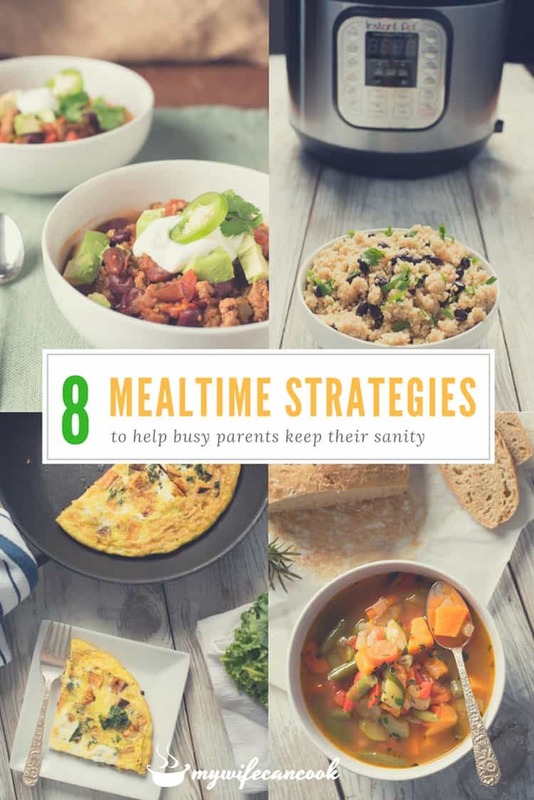 Alright, let’s do a lightning quick review of the above 8 mealtimes strategies for busy families that can help you preserve your sanity. You need to plan it, Instant Pot it, prep it, batch it, supersize it, freeze it, reheat it, reinvent it, and combine it! Got it? Hey, was that the doorbell? Just kidding, but you know something crazy is going to happen today so you better stop reading this and you better get back at it. Best of luck!